In a little village called Sustead, not far from Cromer in North Norfolk you will find Kim's Norfolk Kitchen. Cookery classes for everyone from the complete beginner to those budding Master chefs! Kim caters for adults and also runs children's classes. So whether you are looking for a one off session, children's after school club or something more specific then Kim can help you. Emily was lucky enough to attend one of the "Cooks in the Making" sessions during the school break. 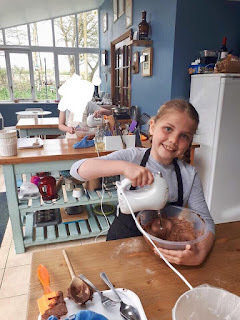 Em's is a keen cook at home, often wanting to experiment with home baking. So when we saw Kim's Norfolk Kitchen we knew she would love it. Grandma and Grandad treated her for her birthday and when the day arrived she was very excited, she didn't even seem to mind the early wake up alarm! The session she was booked into started at 9.30am and Emily was greeted cheerfully by Kim and her husband (whom also helps with the classes, according to Emily, he had to do all the cleaning up!) There was just Emily and one other little girl for this session, Kim likes to keep the classes small to create a relaxed environment and plenty of interaction. Everything you need for the session is provided by Kim and she started off by showing the children the kitchen and talking through what they would be making. 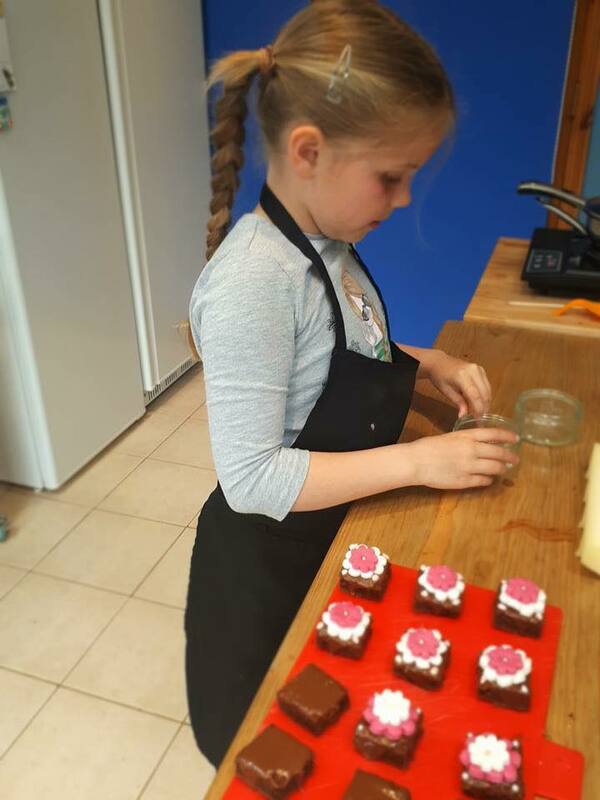 The classes are held in her bright and airy purpose built kitchen which has spacious work stations and a large table for groups. It is well equipped and Kim is obviously a passionate chef herself. Then it was time to get started. They would be making Mini Chocolate Cakes. The children do everything themselves and get to use all the utensils independently to develop their skills. Emily made some pretty comical faces when using the electric hand whisk! Once the cakes were cooked, they had to trim the edges and level out the top, when this was done, a chocolate glaze was made and drizzled over the top. 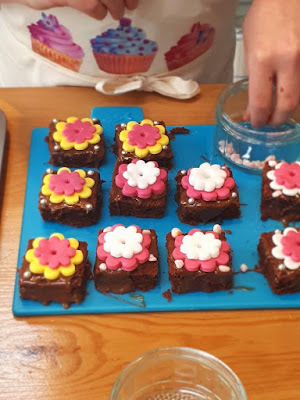 Then Emily set about decorating each individual cake with sugar fondant flowers that she had made whilst the cakes had been cooking. Whatever you make during your session you get to take home (Kim provides containers for transporting the food.) And a copy of the recipe that you have followed, so that you can recreate it at home and share with your family and friends. The session Emily attended lasted for 2.5 hours and cost £30 all inclusive. The classes vary in price depending on what you are looking for and full details and calendar can be found on her website. For more information check out Kim's website or find her on Facebook. Kim has a fully CRB check, up to date Food Hygiene certificate and holds a Food Rating Grade 5. 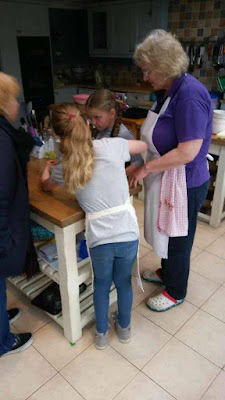 "I really loved the cooking session and Kim was really fun. I liked the work table and how everything I needed was there. I thought the chocolate cakes were going to be hard to make but Kim helped us and I actually found it easy. 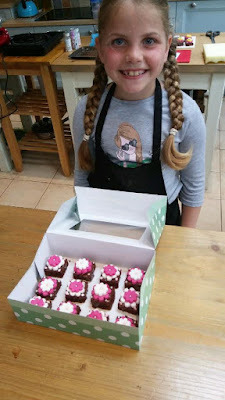 They tasted really good and I was really happy to show them to Mum, Dad and Mollie when I got home. Kim was nice and she didn't even tell us off when we got the giggles! It was good fun and I would love to go again one day." This looks like a fun and creative way to spend with the kids. It's nice to get them off screens and into using their hands. Mini anything is always great. Those cakes look delicious! Emily did a great job! Her treats look delicious. You're gonna have me looking for a kids cooking class in my town. Thanks for sharing Chris!